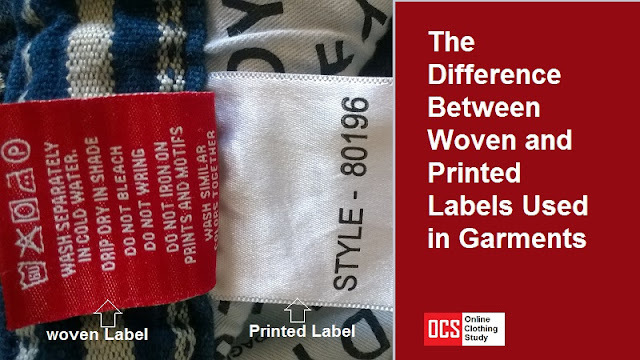 What is the Difference Between Woven and Printed Labels Used in Garments? When you are manufacturing clothing, you have a lot of choices to make. One of the last ones, though, is what kind of label you will use to refer important information such as the size or how to wash the garment. Your two main choices are woven labels and printed labels. However, what is the difference? How do you know which one is the best choice for you? Don’t stress, though, because in this article we are going to discuss the differences and how you can choose the best label for your clothing. What Is A Printed Label? First, let’s take a look at printed labels. These are commonly made of satin, cotton, tyvek, or a poly blend fabric. These tags are made by making the tag itself first and then digitally printed on the logo, instructions, or whatever you need to go on the label. Labels like this are soft but they may not hold up over time and many machine washes. Learn more about the printed label manufacturing process. What Is A Woven Label? Woven labels are made on a loom instead of being digitally printed. This means that the design in your logo, text, and artwork are actually woven into the tag rather than printed onto it. These labels are soft and usually a bit more durable than a printed label. These tags can be made out of a variety of materials and each comes with its own advantages and disadvantages. Taffeta is one of your cheapest choices when it comes to woven labels and since it dries quickly, it is good in garments that are going to get we often such as bathing suits. In this label, the background is made up of taffeta while the logo or text itself is woven in with damask thread. Unfortunately, there are some downsides to taffeta woven labels as well. For one, these labels aren’t as durable as some other common materials like satin and damask, so they will show some wear after a while. In addition, since taffeta is so thick, it can feel scratchy when pressed against skin, leading many wearers to just cut it out anyway. Satin woven labels are made from a soft, polyester satin blend that gives them a shiny look. These labels are most often used in clothing that needs to be extremely soft or delicate such as baby clothing or lingerie. Much like the taffeta label, satin makes up the background of the label while damask thread is used to create the logo and text that you need. These labels are durable as well and will stand up to multiple washes with no problem. However, there are a few main downsides to using satin woven labels. First, satin is priced a little higher than taffeta. In addition, the low thread count doesn’t allow for detailed designs and the color options are limited when it comes to satin. Finally, another common woven label is a damask woven label. These are the most common types of clothing labels and are made of 100% polyester damask thread. One of the best things about these labels is that they have a high thread count. This allows for a more detailed design on the label than taffeta or satin allows for. These damask labels are soft and durable; they won’t fade when they’re washed. They also offer a wide variety of color options so you can choose exactly the color that will match your garment. However, these labels do come at an extra cost by comparison to taffeta and satin. When it comes to the type of label that you should use in your garments, there is a surprising amount to consider. You need to consider aspects such as pricing, material, and more. However, knowing your options between printed and woven labels is the first step to choosing your perfect label. Annabelle Short is a writer and a seamstress of more than 5 years. She splits her time between London and Los Angeles. Annabelle is a mother and she loves making crafts with her two children, Leo (age 9) and Michelle (age 11). As a craft lover, she would like to start an online Arts & Crafts business. Online Clothing Study: What is the Difference Between Woven and Printed Labels Used in Garments? Do you know the difference between a printed and woven label used in garments? Read this article to learn more.